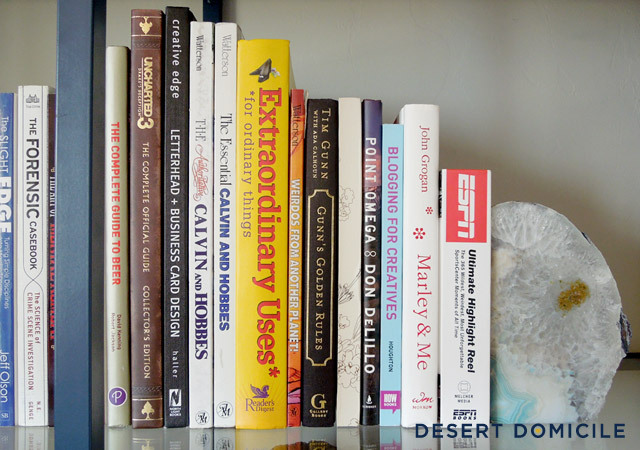 Our office shelves are D-O-N-E! I finally finished styling them over the weekend and have successfully blended the geek (my boyfriend) with the chic (me)! For those that are new here, my boyfriend is a gamer. 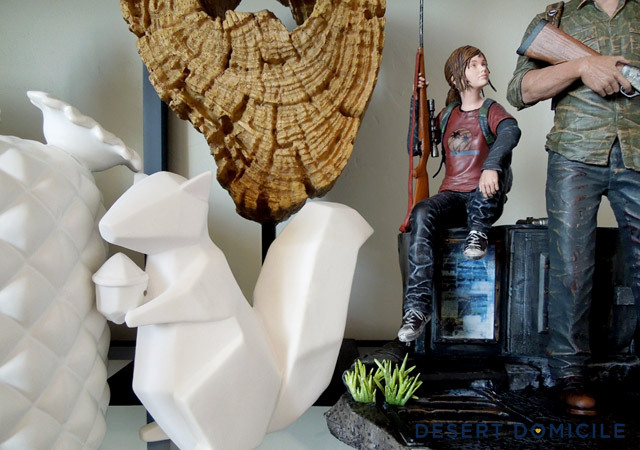 He buys collector's editions of video games which come with limited edition items like statues, art books, and other miscellaneous collectible things. 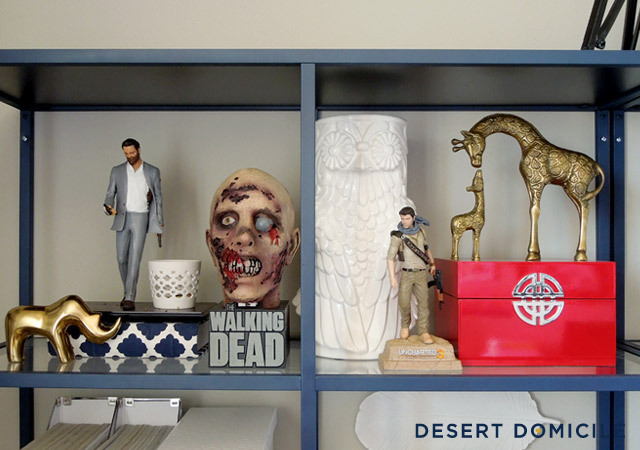 You can see two of the statues below – a Killzone one on top of my DIY faux malachite boxes and one from The Last of Us on the far right. 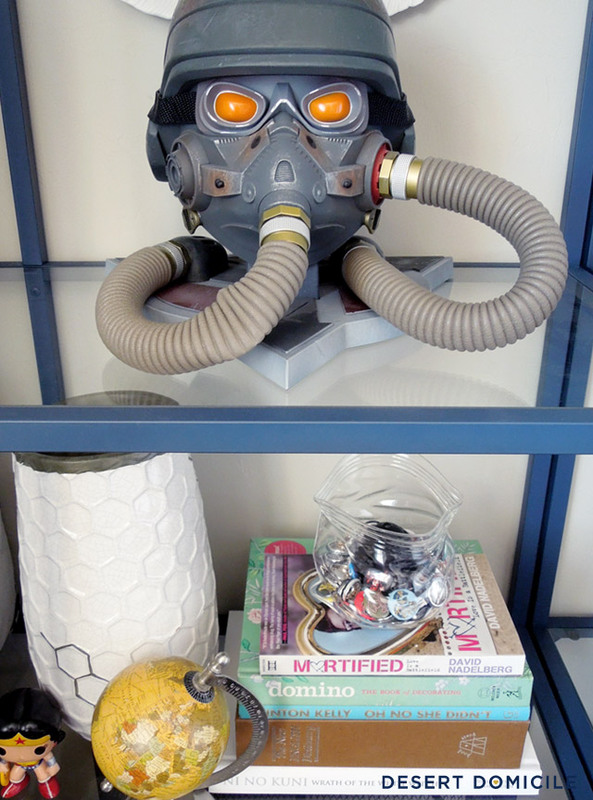 Sometimes I feel like his stuff isn't represented as much around our house as my stuff is so I wanted to style the shelves with a mix of our things. 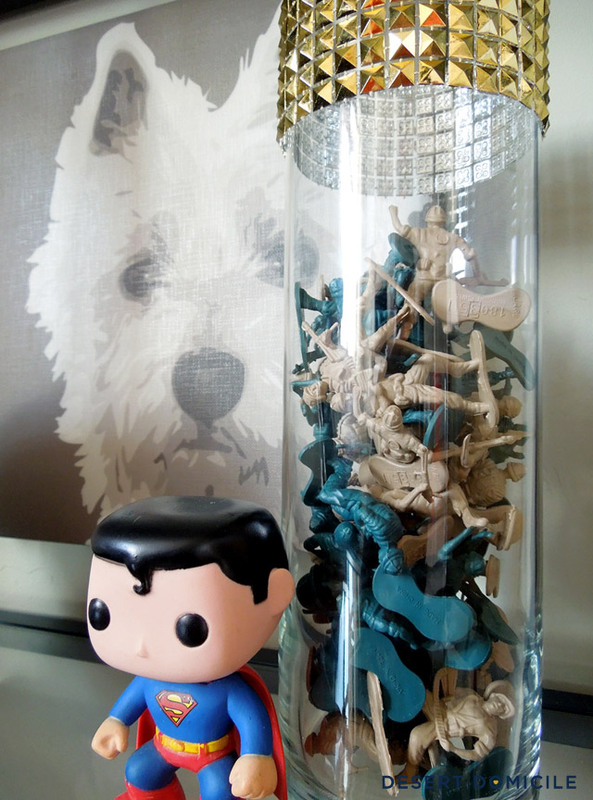 I filled my DIY pyramid stud vase with a bunch of army men because... well, why not? 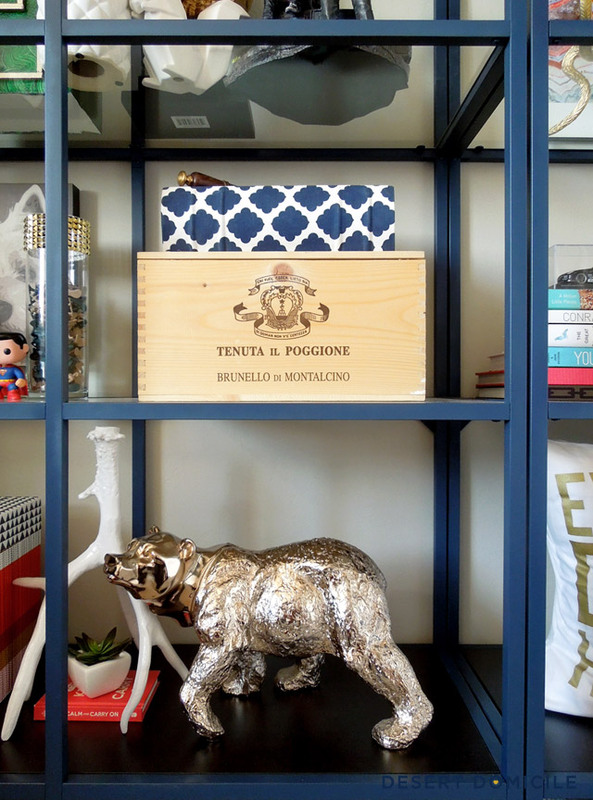 Mixing my boyfriend's things in with mine meant I didn't have to spend a dime to style these shelves! Yes friends, I had that. much. stuff. I still have more that wasn't used too! See that mask in the top left corner below the feather? It's one of my boyfriend's collectible items I actually like! Fun fact: my Giuliano De Medici bust weighs 25 pounds! 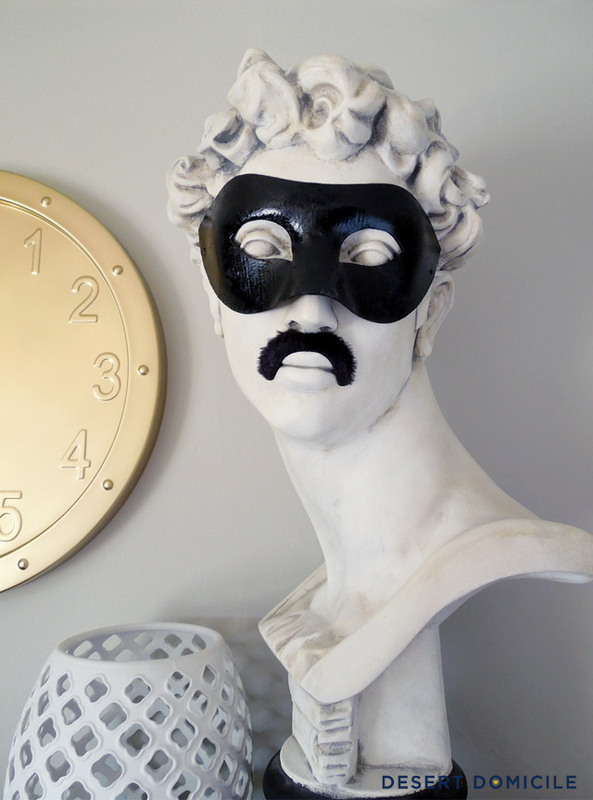 Yes I weighed him haha It's also been sporting this masquerade mask and mustache for 2 years. I took it off once and he looked weird so it stays! The wine box below came from the catering company my boyfriend used to work for before he moved to Arizona. I don't drink but does anyone know if it's a good wine? The name seems pretty fancy! I wasn't sure what to put in the lowest shelf behind the chair since the chair would block it. 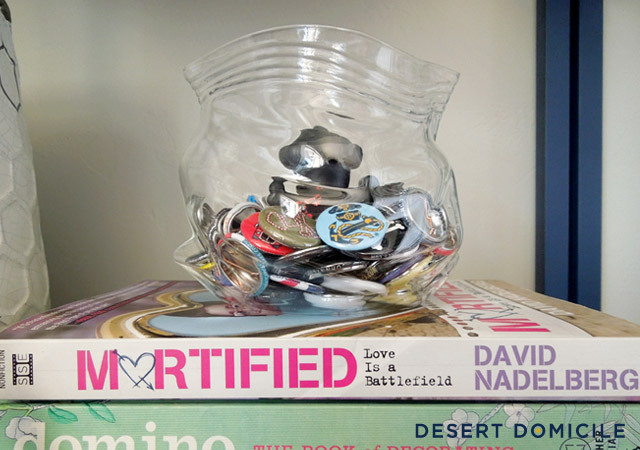 You've come a long way little shelves! What do you think of the shelves? Are they what you expected? Have you ever had to blend two styles together? I love how the combination of you and your boyfriend is displayed. It turned out beautiful! My favorite is the glass ziplock bag. I have a slight obsession with ziplock bags LOL. And I love the gold octopus and giraffes. that was quite a challenge. Maybe you should try out for design star! but i really liked how you did it. and I'm envious of your chic things! You did a great job styling these! 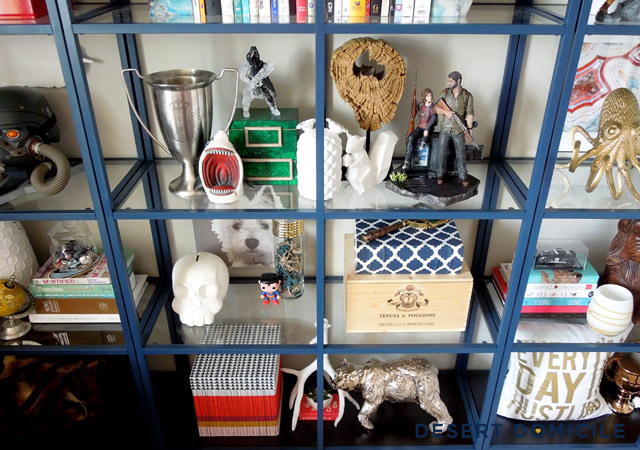 I have to admit that I probably would've just stuck all the "geek" on the bottom shelf in a row & decorated the rest with the "chic" but I love how you managed to combine them! Nicely done. I'm struggling to combine my boyfriend's decor with mine right now- it's tough! So I give you a lot of credit. 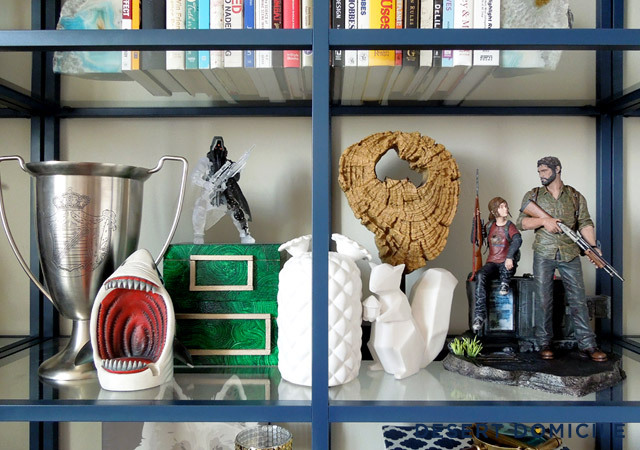 Question- where is the agate/stone bookend from? I've noticed you have a few agate related decor items, and I'm having such a hard time finding some. I would love your suggestions! Thanks Julia! Isn't that bag great?! I love it but it's made of really thin glass and I'm constantly worried it's going to break. Thanks Erin! Oooh, angled shelves sound interesting! If they're what I'm thinking, you could always anchor things to stand straight up and down on the shelves with some command strips! Thanks Sarah! My boyfriend really thought that's what I was going to do haha That or have his stuff all grouped together in one section and mine in another. I wanted a happy balance of both styles though and I think I pulled it off! You can do it, Amanda! :) Anything agate/stone related you see around my house has come from a local gem show I frequent every late January/early February! They sell wholesale pieces to the public for dirt cheap and I stock up then. 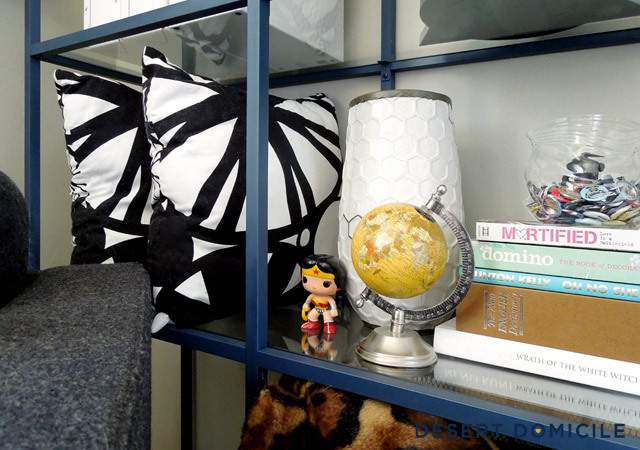 I've also seen agate decor pop up at HomeGoods if you have one of those near you. If not, Target is selling faux agate pieces now! Yes I have been, Caroline! Medici is pretty cute haha I just hope his weight won't cause the shelves to buckle and come crashing down! Totally worth the wait :) Well done, the shelves look amazing! So many cool things, love the monkey and the owls. 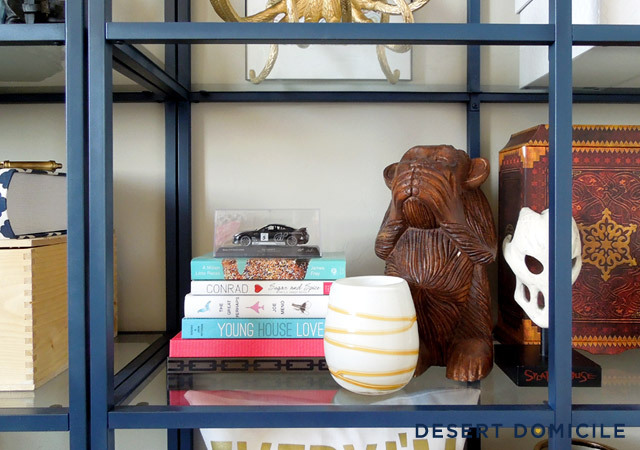 Your shelves look fantastic! 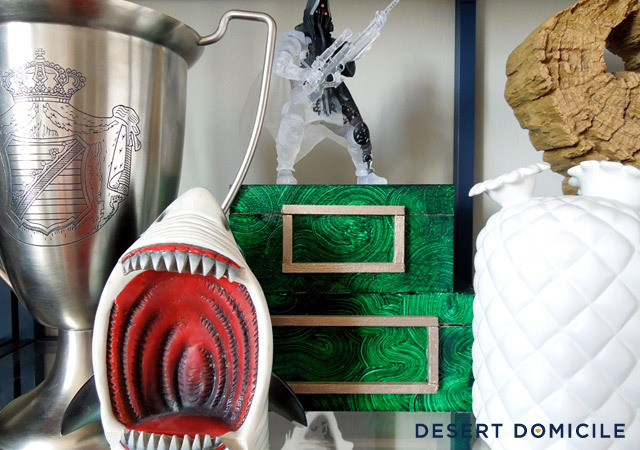 I actually love the addition of your boyfriend's collectibles - it's so much better to have things that spark conversation, rather than boring chotchkies from HomeGoods. I don't know if you watch Big Bang Theory - but if you do, I think this would totally be how Penny would style her bookshelves if she lived with Leonard. They look amazing! I'm exhausted just thinking about all the work it must have been to get them to look that way. Feel free to send any wine this way to be consumed post childbirth. Just throwing that out there! 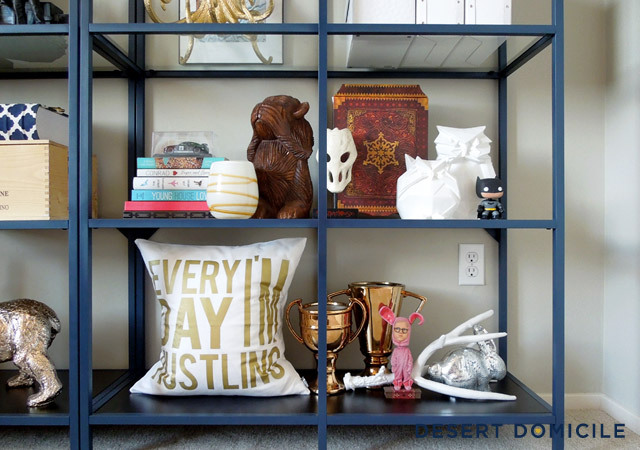 I have never seen pillows used to style shelves and I just love it! So creative!! 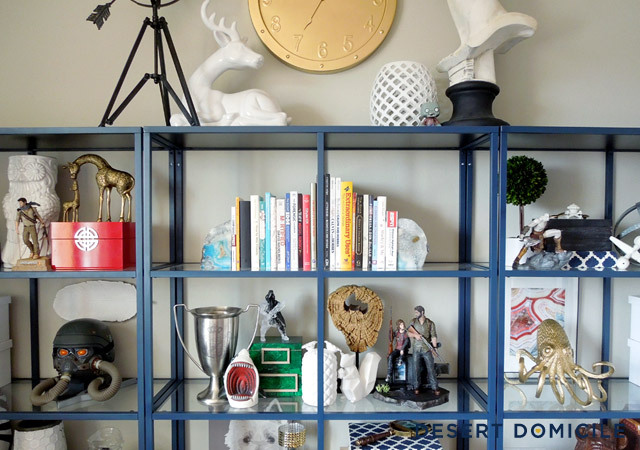 Really, it's a wonderful collection of things that are so interesting and tell a lot about you guys as a couple, which is so important when you're decorating and designing. This really is a wonderful success! 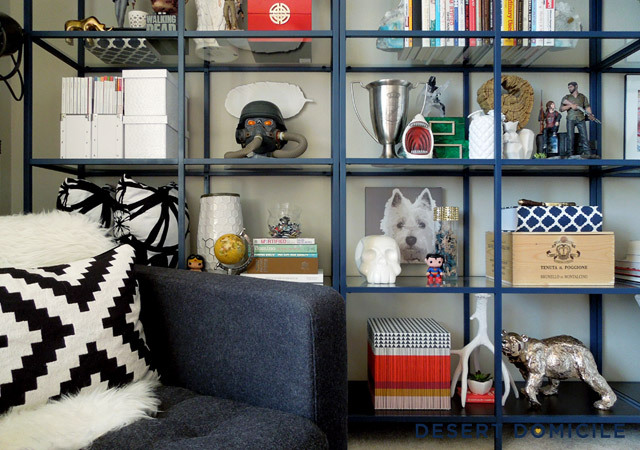 And those shelves are totally gorg. Thanks so much for sharing such a great project! Nice job combining the two! 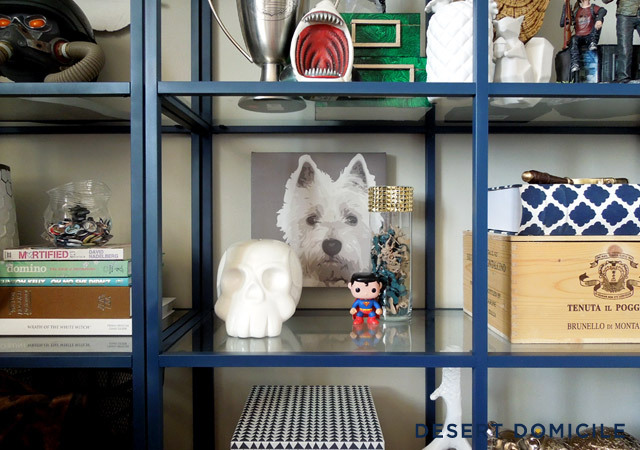 A few of my favorites are the dog print, the small vase in front of the monkey (it looks like the smaller version of the big one I got from Target recently) and the glass zippered bag. 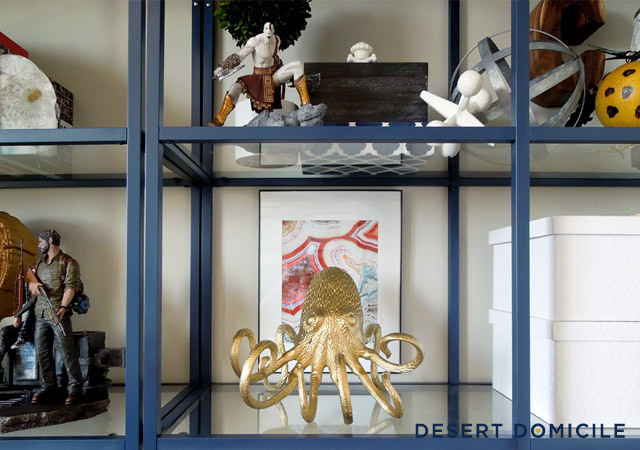 Love the IKEA Vittsjo shelves. Great styling. The comment about about the Big Bang Theory is bang on! Where did you get teh bust from? Gonna get the glass zipper bag now. Awww, thank you Melanie! You're so sweet :) No, I didn't edit any of the items out, I used everything he had except for the boxes the stuff came in but they were just your typical packaging, nothing special. 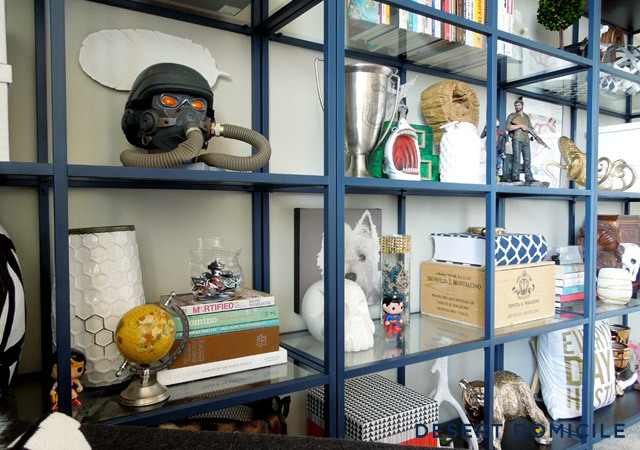 In fact towards the end of styling the shelves, I kept asking if he had more stuff because I was running out of things to use haha Off to check out your blog! This turned out AWESOME. 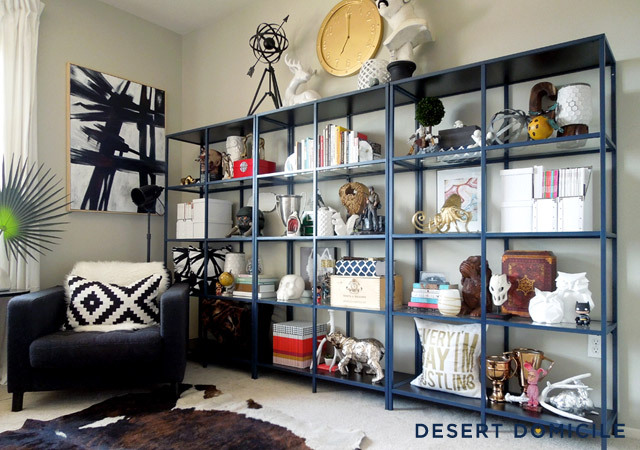 I'm always so impressed by how well you can style shelves. And this is just so much space, I would have been overwhelmed for sure. I just dont' have the patience. I really love how you mixed your styles. It really feels curated (overused term of the century) and intentional. I love it. Seriously, you are a master. Like a Jedi Master of styling. You have done such a fantastic job of integrating both of your loves...it's awesome! I love how they turned out! And how awesome that you didn't have to buy anything new to fill them up. 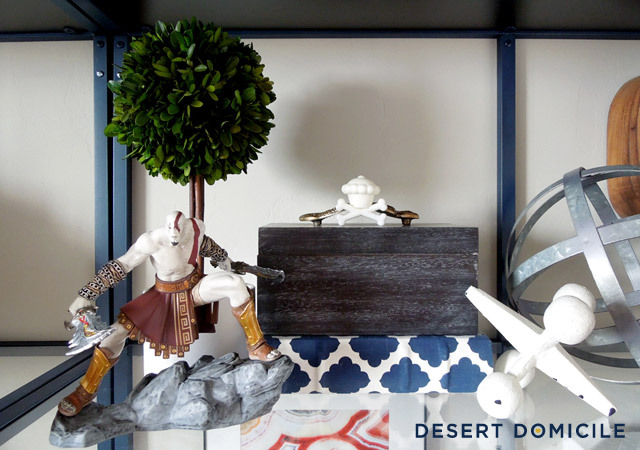 I seriously own almost NO stuff that I could use to decorate shelves (unless we're counting Hot Wheels, I have A LOT of those! ), and I'm always hesitant to buy it because I'd so much rather use stuff that is special or meaningful, exactly like you did. Anyhoo. They look fantastic and you did a great job of keeping it chic and classy while mixing both you styles and interests. Beautiful! Found you via a Vittsjo search on Pinterest. 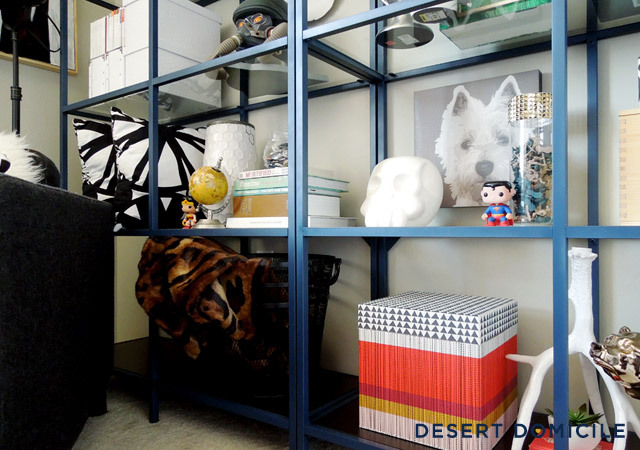 What caught my eye first was the mix of sizes and shapes of all the accessories and how they fill up the shelves nicely. Funny to see what some of them are up close. You did a nice job of mixing all the gamer stuff in with your pretties. The second thing I noticed is that the Vittsjo is painted blue. Love! We've all seen it painted gold, which is great, but I like to be different. I've been considering painting mine blue too, so I was delighted to come across yours. Your blue color is nice and dreamy, kind of like the color I've been thinking of painting my living room walls, which is also where my Vittsjo sits. I have some royal blue spray paint on hand, so I might just go for it because it would probably still look cool if I do paint the walls blue too. If you don't mind, I'd like to feature/link to this on my blog! You are so crazy talented! I'm really enjoying going through some of your posts. 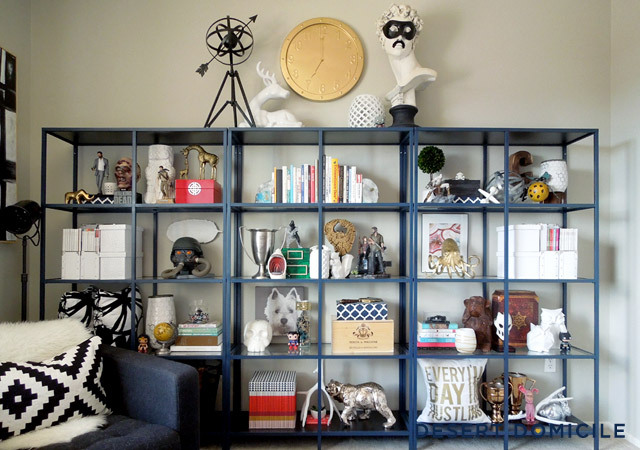 What an eye you have and I love the bit of fun and whimsy you put in each space. Can't wait to read more! HI!! I love these! 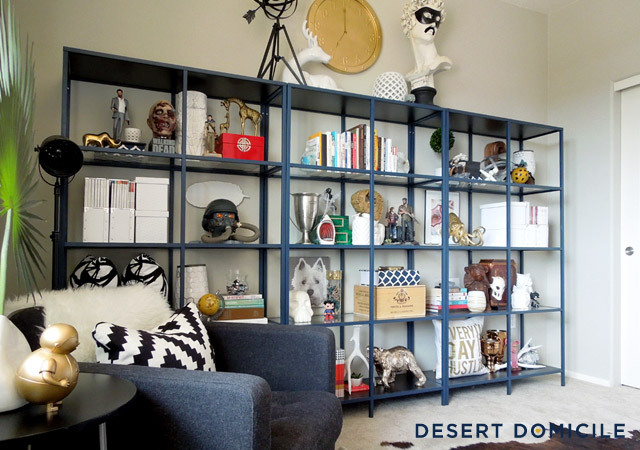 I'm currently looking at getting these shelves... Did you paint them? And with what? I LOVE that gold bear. Where is it from? "in case the temperature ever drops below blowtorch level" literally made me laugh out loud.....and then chuckle a few minutes later when i thought about again.......and then again when i went to copy and paste it here. Love the whole look. I want to know more about the gold bear!!! The blue shelves not avail in france or usa. Only,red,white,dark. Where are you? I'm in the USA. 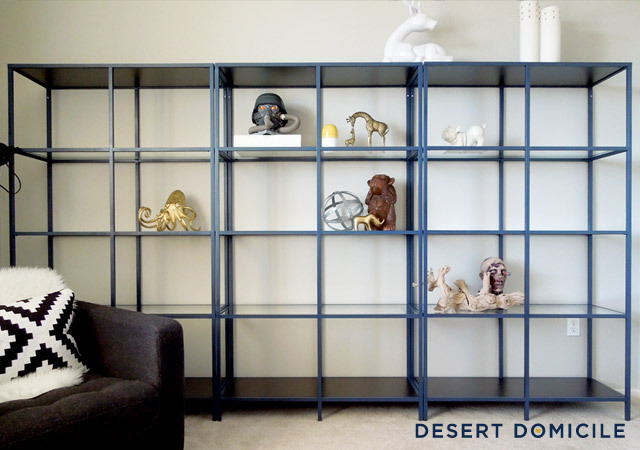 I bought the black-brown version of the shelves and spray painted them blue! Would you mind sharing the paint color? Was it difficult to paint? Looks beautiful!